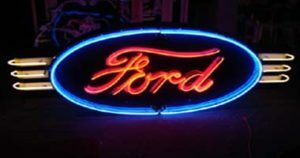 Old Ford Porcelain Neon Sign "SOLD"
Old Original Ford Porcelain Neon Sign with bull noses...."SOLD" These signs are not rare but very desirable... Vintage Old Original Ford Porcelain Neon Sign from 1950's...Automobile Dealership Sign in excellent condition. SOLD !!! You can design a great Man Cave with the genuine and famous gas signs and oil signs, pumps and globes. Do you remember the old filling stations? It is a part of our great Americana, and these vintage oil gas signs have a beautiful artistic value. 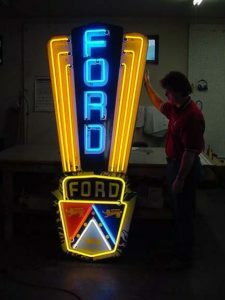 Vintage Neon Signs, Our Old Sign Collection, About Us, How to Make Porcelain Signs, Vintage Lithograph Metal Sign, Vintage Neon Clocks, Best way to Clean Porcelain Signs, Fake Porcelain Signs, Vintage Neon Signs, Trade Signs, Old Signs Wanted & Vintage Signs for Sale, Old and Unique Advertising Signs to remember. Our collection of signs dated back from 1800’s to the 2000’s, and we let our customers know what materials they were made of. Vintage signs are a rare sight which adds a huge charm and have a great history. 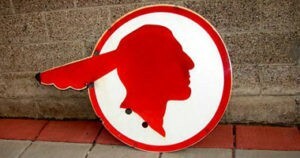 We also deal in selling, purchasing, collecting vintage porcelain signs and various old Antique signs. Shell, Mobil, Mohawk Gasoline, Mustang Gas, Holiday Gas stations, Magnolia, Texaco, Standard Oil, Buffalo Gas, Sinclair, Frontier, Gulf, Hudson, Flying A, Esso. 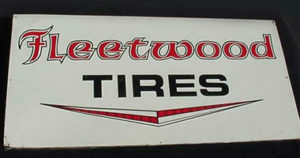 Also, you can see various other brands like Pure, Hancock, Richfield, Pathfinder, Quaker State, Wolfs Head, Richardson’s, Johnson Gasoline, Polly Gas, Havoline, Indian Gas. Phillips 66, American Gasoline.. Furthermore Red Indian, Musgo Gasoline, Beacon, Oilzum, Golden West, Derby, Union 76, Red Crown Gasoline, Marathon, Speedway, BP, Amoco, Atlantic Gasoline. And also Castrol Motor Oil, Veedol, Skylark, Powerlube, Deep Rock, Dixie, RPM, Gargoyle, Ford Motor Oil, Cruiser Motor Oil. Sunoco Gasoline, Lincoln, Navy Motor Oil & many many more brands of Oil & Gas. We have many things on offer, some of them include History of Vintage signs. 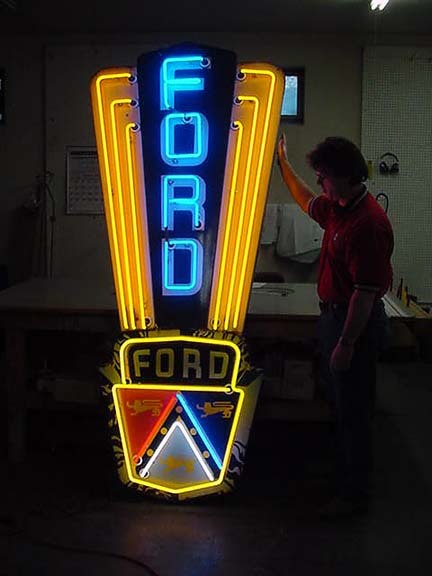 Don’t forget to view our page for some history of Neon & Vintage neon signs. You can make an incredible MAN CAVE with unique gas and oil signs , pumps and globes. Likewise from our Gas, Auto & Oil Signs Gallery old filling stations are a piece of our awesome Americana and these sorts of collectible have an excellent imaginative esteem. We have numerous old vintage signs and a portion of these are old GAS and OIL Companies that utilized illustrations. Some are delightful and analyzes to a bit of craftsmanship holding tight the divider. Moreover we get Vintage Oil Gas signs, Pumps, Globes once in a while.